Ships from United States. Most customers receive within 3-18 days. - 1936 MHz engine clock for outstanding performance and gaming experience. - DirectCU III with Patented Wing-Blade Fans delivers 30% cooler and 3X quieter performance. - ASUS FanConnect features 4-pin GPU-controlled headers connected to system fans for optimal thermal performance. - Aura RGB Lighting with Modular Shroud to express personalized gaming style. - GPU Tweak II with Xsplit Gamecaster provides intuitive performance tweaking and lets you stream your gameplay instantly. This item is covered by GCI Micro Return Policy. Pros: The order arrived the next day, two days faster than expected. The packaging was very good - Bubble wrap from the seller, lots. Other Thoughts: I would give this seller FIVE STARS for super quick service, good packaging and the full refund on the product. Pros: this card looks amazing, it can easily run any game 1080p ultra settings. It Looks stunning, and the RGB works like a charm, there is great software to both control the rgb and the overclock. it has great temps/ and its quiet because the fans only activate when the card gets hot. highly recommended! Cons: I think this card is amazing but the only tiny con i could think of is that there is some light bleed on the logo side of the card so if you want a SUPER neat build keep that in mind. The bleed is pretty bright but it doesent light up half of my case or anything. Cons: - The size. When I was looking around for cases, some were ruled out because their interior width was not long enough. Make sure to check your choices! Pros: Fast. Maxed out all the games I could throw at it. Super quiet for the size of the card. Fans didn't even kick on in some of the less demanding games. Lighting on the card is pretty cool. Cons: It died after 7 months of using it. Sent it back to Asus for RMA and it's been awaiting parts for over a week. Not happy with RMA process or Asus customer support. Other Thoughts: I've always loved Asus, I've purchased GPUs and Motherboards from them whenever I had the chance but this may be the last product I purchase from Asus after dealing with the RMA process and customer support. The card has been at Asus for a little over a week and half at this point and over a week of that time the status has been "Material/spare part(s) shortage. Item is on order and/or incoming". I contacted Asus and got a generic we will notify you when the repair is completed, no help what so ever. No estimate of time or what is wrong with the card. I emailed the rep back and asked for more of an update, even if it was 2 weeks estimate that would be fine I just wanted some sort of update (I had received none at this point, no we received the product, diagnostics under way, nothing), instead I received another generic "once the part is in it will be reserved and you will be notified upon completion of the repair". Again providing me no information and not avoiding the questions I asked. 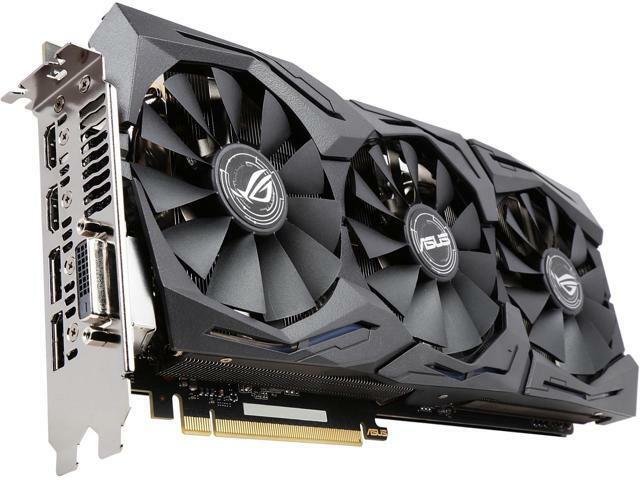 If the wait is going to be weeks or a month for an almost $700 flagship GPU within a year of release, either fix it or replace the card with a new one, this is unacceptable. Unfortunately after this experience with Asus's RMA and customer support Asus just lost a previously loyal Asus fanboy and customer. I've always sworn by Asus's products and purchased or recommended them whenever possible, sadly it's unlikely I will be purchasing from them in the future just to avoid dealing with the RMA and customer support and will definitely will cease to recommend them to any friends or on any forums. Other Thoughts: If you want to take in the amazing scenery of Witcher 3 in 4k at impressive frame rates, there are very few cards that can handle it. This is one of them. Pros: Great at 1440p. I can max out everything and play @ 60fps+. Cons: I guess I lost the lottery, because I can only achieve a very small OC. Like +23mhz over the OC mode with about 120mhz on Memory clock. I'm disappointed over this, but the card is already clocked fairly high over the base clock. -Stays cool, haven't had a single problem or worry with heat. -Software is much better than it used to be. Other Thoughts: -Memory overclocks with any 1080 seems to hit performance, I assume that will likely be addressed in a bios update but keep that in mind and keep an eye out if that is a concern of yours. It hasn't impacted me at all really as the card is a true powerhouse, but I imagine it could in the future.